Creative Reuse, Community, Donations, Education, News, Thank you! Dawn St. Clair, Rick Pogue and Stan Pulliam with Heffernan Insurance dropped by the ReBuilding Center last week to present the ReBuilding Center with a check for $3,000 to support ReBuilding Center’s ReFind Education Program, which provides hands-on educational classes for adults and kids on how to safely and creatively work with used building materials. This important donation will help support our ReFind Education program by supplying our shop with much needed equipment such as chop saws, nail guns, band saws and other various hand tools which will strengthen our capacity to bring hands-on learning opportunities to 7th graders and basic carpentry and DIY classes to adults! “The support couldn’t have come at a better time,” said Dave Lowe, Volunteer Services Manager, “we need new equipment and replacement parts and are so grateful for Heffernan’s support!” ReFind Education offers a three-day class entitled “Three Stringed Theory,” through Portland Public Schools’ 7th Grade Maker Experience. Students from Beverly Cleary Middle School were building three string guitars when Heffernan’s associates came to present their check. What a year! February 2016 seems like eons ago—when Portland City Council voted unanimously to approve the nation’s first ordinance mandating the deconstruction of all homes scheduled for demolition built prior to 1917. (These homes represent about 33% of single-family home demolitions.) You can watch the Council debate here; it starts around minute 70 and includes testimony from the Bureau of Planning and Sustainability’s (BPS) Shawn Wood (1:19) and yours truly, Stephen Reichard, the ReBuilding Center's director (1:37). This landmark resolution will create jobs, increase safety related to lead and asbestos materials, and divert 4,000 tons of building materials annually for reuse. This is a crucial and pioneering first step, and we will work hard in 2017 to adapt to the growth of the deconstruction sector and drive further progress. February also saw the dedication of the Sons of Haiti’s new food cart lot just to the south of the ReBuilding Center (RBC). A true community-wide partnership, dozens of supporters from across the neighborhood donated nearly $11,000, which was matched by $40,000 from the Portland Development Commission, in the effort to rebuild the lot to bring it into compliance with city code. This rebuilding effort established a significant revenue source for one of the last remaining Black-owned enterprises on Mississippi Avenue. In March there was the Building Materials Reuse Association’s (BMRA) bi-annual gathering in Raleigh, North Carolina. Fresh off our legislative victory in Portland, the ReBuilding Center’s DeConstruction Services Manager, Doug Lichter; BPS’s Shawn Wood; and Metro’s Bryce Jacobsen told the story of the four-year effort to enshrine deconstruction as the preferred method over demolition. A local group of deconstruction industry representatives has submitted a proposal to host the fall 2017 BMRA DeCon Conference in Portland—the new epicenter of deconstruction. Remember York? A one-man play about the first African American to the Pacific Northwest? We co-produced this play with the Native American Youth and Family Association before an audience of 500 at Jefferson High School Auditorium in early March. More coalition building followed in the spring as the RBC’s Volunteer Services partnered with the African American Alliance for Home Ownership to establish a new tradition—Day of Service. More than 35 volunteers conducted much needed repairs on five homes in Portland’s North/Northeast Corridor for homeowners at risk of losing their homes. The Village Coalition, a network of urban villages and their allies representing Portland Metro’s houseless community, got its start at the ReBuilding Center in March. We hosted 25 meetings fueled by generous food donations from Mississippi Pizza. When the Village Coalition meetings recently grew beyond the size of the RBC’s conference room with the involvement of many village residents and allies, we facilitated a move to the Albina Youth Opportunity School. The Village Coalition inspired an innovative private sector initiative to build hard tents or “pods” for Portland houseless communities, 18 of which were built in the final quarter of 2016. With the incredible support of City Repair, Congregation Beth Israel, Castaway Portland, Tivnu, Oregon Tradeswomen, Constructing Hope, Portland Youth Builders, Natural Felt, National Urban Housing, Center for Public Interest and Design, and many more—including Andy Olshin and the Village Coalition—we will build up to 100 more pods in 2017. The ReBuilding Center continues to supply building materials (along with the help of Lowe’s and Parr Lumber) for this initiative as well as transporting the tiny houses around town. During the summer, nearly 100 individuals came together to advise the RBC as it considers re-developing the north end of its property. That report has provided RBC with the invaluable wisdom of the community as we seek to leverage our space to the fullest potential to expand our mission to strengthen the social and environmental vitality of our community. An extraordinary spoken word event at the Mississippi Street Fair; the construction of a new reused materials studio at XRAY.fm; the opening of ReBuilding Center Japan; the first of a new annual Labor Day community celebration at the RBC, complete with the lumberyard music stage (this year's event honored the retirement and service to community of long-time Community Outreach Manager Linda Hunter); and so much more—we could not and would not have realized so much with the support of so many of you. And let’s not forget Lean Portland, an extraordinary group of professionals who are giving up their Saturdays pro bono to help the RBC become a more efficient and effective organization to better meet the needs of our guests and our community. When you visit our store in 2017, you’ll notice “lean system” efforts underway! With the support of the Energy Trust of Oregon, we converted to LED lighting. With the support of the Autzen Foundation and the Portland Development Commission, we were able to undertake a feasibility study to explore the expansion of our space and mission. With the support of the Collins Foundation, we are well prepared for the challenges of successful implementation of the deconstruction ordinance. We deconstructed 20 homes and dozens of kitchens, garages, bathrooms, and barns in 2016. These projects diverted nearly 3,000 tons of materials from the landfill; saved more than 40,000 gallons of water; and prevented some 500 tons of carbon from being released into the atmosphere. None of this would have been possible without the assistance of nearly 2,000 volunteers, providing us with more than 20,000 hours of your precious time. This was your year—from ushering people to their seats at York last March, to repairing homes in June, cheering on the spoken word in July, and building sleeping pods in the fall. And each and every day, processing materials, putting them on the store shelves, and taking them off the shelves again to give to our guests. 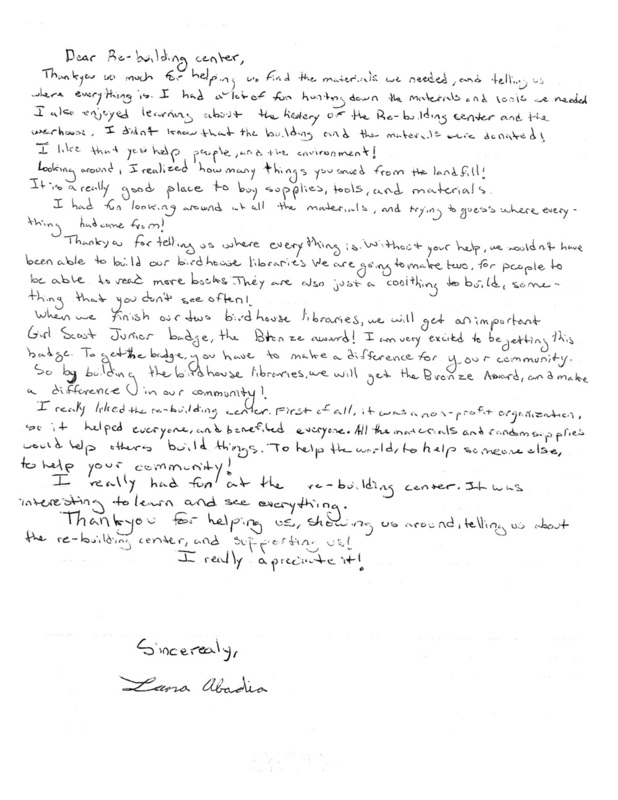 Our customers, volunteers, supporters, and staff—the ReBuilding Center community without whom we would not even be here. We may remember 2016 as an extraordinarily difficult year—one that may well change the trajectory of our nation and our planet. In what may be challenging times ahead, do not forget to recall what you accomplished this year—with others, in community. You’re amazing. Thank you. The ReBuilding Center participated in the Willamette Week's Give!Guide for the first time this year... and it was a huge success! The business sponsors offered free tacos and drink coupons as incentives as well as a $2,000 donation match from Por Que No. The ReBuilding Center hosted an event at the end of November at StormBreaker Brewing to kick off and celebrate participation in the Give!Guide, where we raised an initial $1,250 from donors. Give!Guide aims to increase year-end-giving participation in individuals 35 years or younger. The ReBuilding Center received more than 100 individual donations, with more than a third of which were made by people under 36 years of age! For this first year participating in the Give!Guide, our goal was to raise over $10,000, and we are excited to announce we met that goal (including Por Que No's match)! Even though the official Give!Guide period is now over for the year, you can still make a donation to support the work and mission of the ReBuilding Center. All donations support the ReBuilding Center’s mission to build community through reuse, including our Community Outreach Program, which strengthens the capacity and impact of community-led efforts to create a more equitable, vibrant, and resilient Portland. 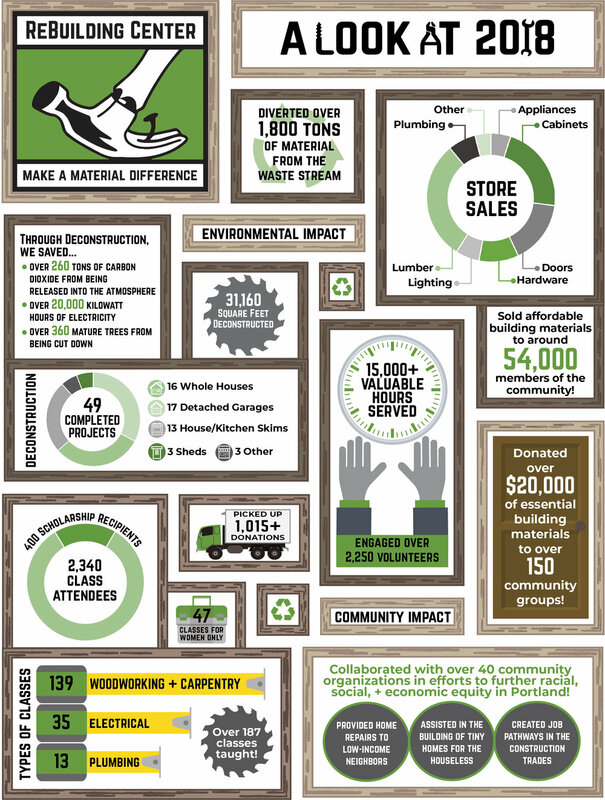 Last year, the ReBuilding Center diverted over 2 million pounds of building materials from the landfill—such as lumber, hardware, lighting, and doors—and sold over 400,000 items back to the community for reuse. Through these sales, the ReBuilding Center was able to donate essential building materials to over 200 local grassroots projects, and our Community Outreach Program was able to support 12 community-building initiatives. Again, thanks to everyone who gave through the Give!Guide this year. We’re excited to participate again next year and look forward to continuing to grow and connect with the ReBuilding Center community! Those of you who have walked by the ReBuilding Center recently may have noticed something new. 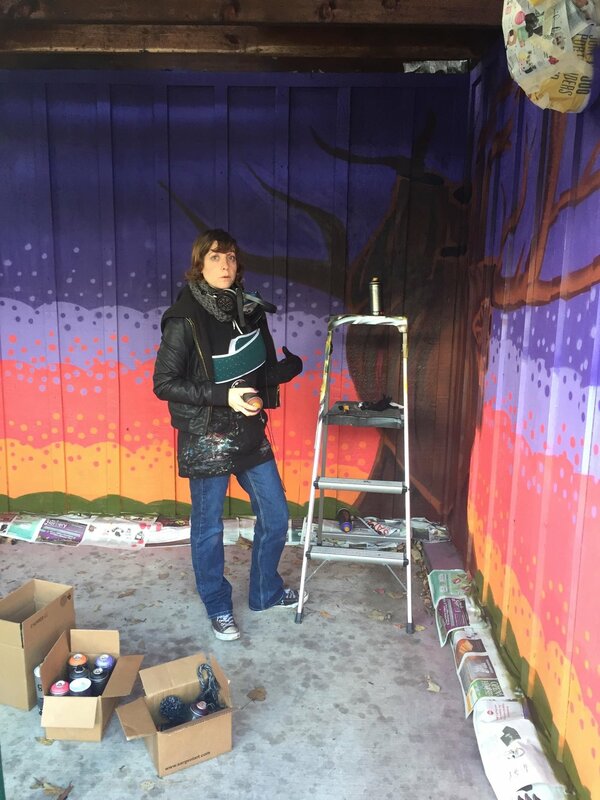 Over the Thanksgiving holiday, artist Jennifer Korsen visited the Rebuilding Center and used her talents to bring a creative touch to our covered bike shelter. The Rebuilding Center paid for the supplies, and Jennifer got to work. Originally, Jennifer’s piece was going to depict an octopus, which was replaced by a heart. Eventually, a heart tree was chosen for the central image of the mural. Jennifer’s official website says that she is known for her work with murals, mixed media pieces, and street installations. She is a traveling artist, and her works have been shown in many places, including New York, Portland, Seattle, and Los Angeles. Some of her pieces have been shown outside the USA, particularly in Germany and the UK. In addition to her professional website, Korsen posts images of her artwork to her instagram account. An image of the Rebuilding Center’s mural is posted there, alongside other new art pieces. Jennifer’s “Heart Tree” can be seen and experienced at the south end of the ReBuilding Center in the bike shelter near the parking lot. Creative Reuse, Volunteers, Thank you! Local artist, Sean Lafferty, came to the ReBuilding Center with the simple desire to get involved. As an artist who lives in the area and who enjoys incorporating salvaged materials as much as he can in to his work, the ReBuilding Center has always been on his radar. Initially applying for an internship position, Dave Lowe, the Volunteer Services Manager, sat down with Sean to gain a better understanding of what Sean would like to do. Following this conversation, the two decided to make use of Sean’s artistic talents in the woodshop and thus began an apprenticeship with ReBuilding Center’s skilled frame-maker, Chris Lambert. 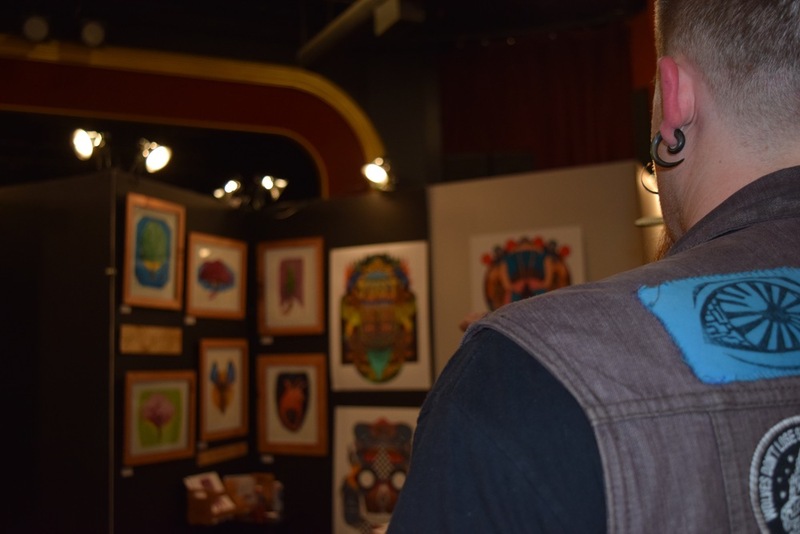 After learning the art, working with the old-growth wood, Sean created his own beautiful frames for his artwork to show in the Pancakes and Booze art show that took place last Friday, June 10th where I was able to chat with Sean about his work. Sean’s says a desire to keep Mother Earth healthy has inspired a passion for reuse. 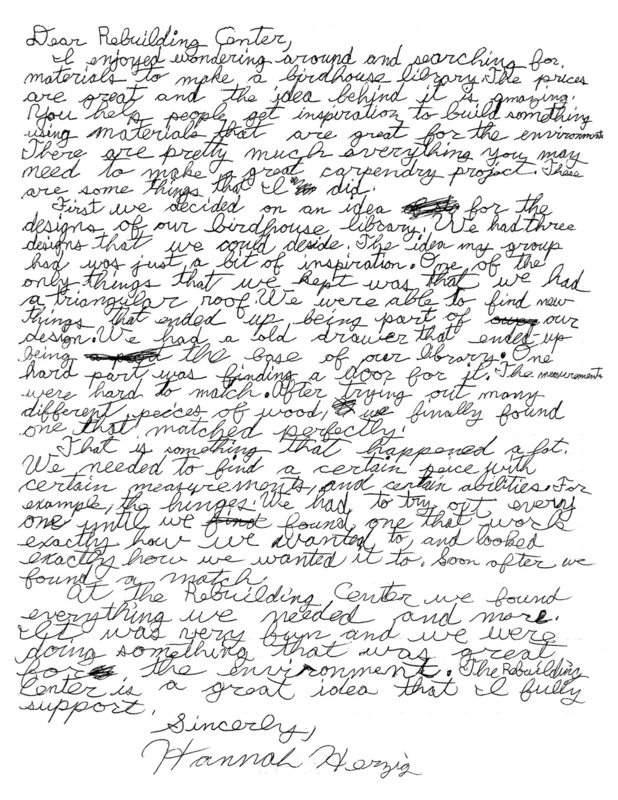 He was influenced at an early age by his father, an engineer, who built an electric car in the 1970’s. In the past he has used cardboard and paint pens as a medium and consistently tries to incorporate reused and natural materials in his work. Sean recalls an early encounter he had incorporating salvaged materials into his art: he found some chip board at a construction dump, took it home and cut it into a frame for one of his pieces on cardboard and finished it off with some used plexiglass. About his aesthetic, Sean says, “used material adds another element of earth and another element of existence.” Sean believes that sometimes the most creative things come from being confined by the materials themselves - it throws something into the process that the artist has to work around to complete their vision and make something beautiful. Although Sean had some experience as a kid in his family’s woodshop, he claims to have no real wood working experience prior to coming to the ReBuilding Center. Partnering with Chris Lambert, Salvaged Specialist at the ReBuilding Center, Sean was taught everything from the ground up about woodworking and building frames. All the pieces at the Pancakes and Booze art show feature his artwork in pigmented Indian ink and is showcased in these reused frames. Sean shared how Indian ink presents its own challenges because it must be diluted with water to get the desired shade of a particular color. For example, you can see all the different shades of color the come from diluting the blue ink background around the oak tree in the framed image on the top left. Sean featured seven different pieces in the Pancakes and Booze art show, most of them depicting different species of trees. Sean explained that the work featured in the art show honed in on two specific topics: “personal change” and “the development of an idea.” For example, the piece of the butterfly undergoing metamorphism represents the process of turning into one’s most fully realized self. In Sean’s tree species series, you can see a seed at the root of each tree. From each seed a massive life form flourishes, which represents the initial “seed” of an idea planted in your mind as it grows into its full potential. This event marked Sean’s third Pancakes and Booze show where he has shown his artwork. Pancakes and Booze is one of the largest pop-up underground art showcases in the country. The event occurs every six months or so and has taken place in over fifteen cities across the nation with the aim to give local artists a pedestal to feature their art outside of the corporate structure. Mélanie Duault, an artist from Vaureal, France, approached us last December with an interest in creating a stop-motion video for the ReBuilding Center. She spent hundreds of hours physically manipulating each shot and then compiling and editing it into a playful three minute piece on how the ReBuilding Center works. Mélanie went to school for photography four years which led to a photo assistant internship with her video teacher in Germany. This experience spurred a move to New York where she attended the International Center for Photography and explored her passion for food photography and color studies. Now she’s happy to be living in Portland, doing lots of freelance work and living life! Mélanie was inspired to volunteer for the ReBuilding Center because back in New York there was a similar organization called Build It Green where she used to spend lots of time getting inspired and picking up repurposed materials for shoots. She was pleased to find us in Portland and was interested in the deconstruction element we provide – repurposing materials that would otherwise be put into the landfill. Her favorite part of the stop-animation process is writing and drawing out her ideas and then realizing the images in her head. This project started with Mélanie wandering around the ReBuilding Center warehouse with a notebook in hand, looking for interesting shapes and colors. For instance, when she found the sink you see in the end of the video, she knew that she wanted to work it into the credits as a little visual surprise. 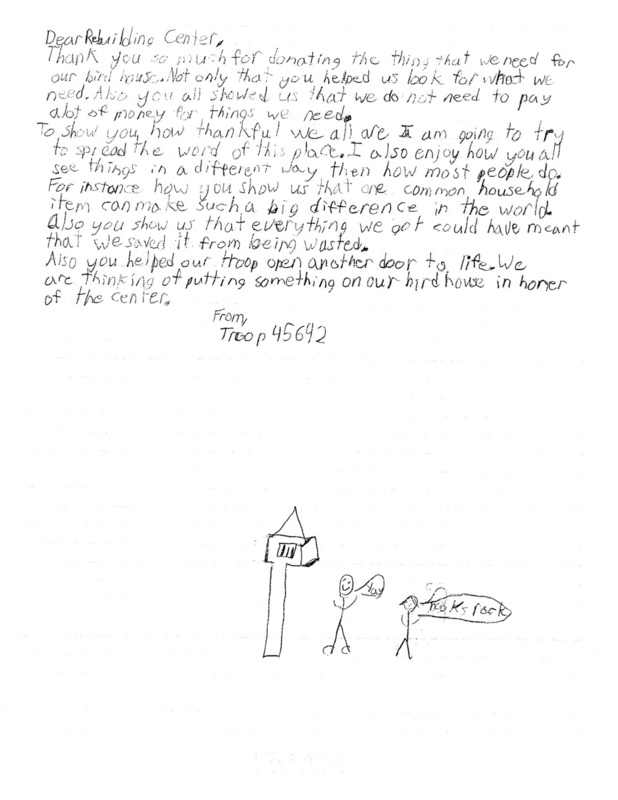 We are so grateful to be a part of an organization that spurs these acts of creative kindness! Check out Stillmotion and you’ll find a band of filmmakers and storytellers, who as a rule, let their curiosity get the best of them. They believe that the process of discovery is just as important as what ends up on the screen. Loving to share their passion for film making, a few times a year Stillmotion hosts EVO, a 4 day intense educational workshop where 3 teams conceptualize, shoot, edit, and deliver a final piece to 3 pre-selected non-profits, to help tell their story and give back. A heartfelt thank you to the team members who produced the film: Michael Gerhman (Neenah, WI), Robert Borejszo (Vancouver, BC), and Paul Harrison (Frisco, TX), and team leader, local Portland photographer, Leah Nash, and Stillmotion! Tokyo International University of America Volunteers! Thanks to students from the Tokyo International University of America for volunteering at The ReBuilding Center all day on July 17! And thanks to Willamette University for coordinating this project. You are awesome! Recent new addition to the warehouse is bringing smiles to the faces of visitors and salvage specialists alike—but one face in particular is beaming with joy. Ella Rose is absolutely radiant behind our brand new cash registers! We are so very grateful and proud of this new addition to the OUV family and we invite you to come meet the new registers yourself! They’re quite sophisticated and oh-so stylish. We want to extend our sincere gratitude to Jim Gerow and all the folks at Positive Technologies, Inc. who patiently guided us through the process and were an absolute joy to work with. Thank you!